Finding the right company for your home improvement goods can be difficult in Tampa Bay. Many businesses appear to provide similar services, but with a closer look, some differences can affect which one is right for you. When it comes to choosing the right shutter manufacturer, there are many considerations to keep in mind. When choosing a shutter manufacturer, one of the most important things to pay attention to is the type of blinds they make. Some businesses specialize in exterior or interior shades only, meaning they might not even offer the items you are looking for. In addition, the design of the shades themselves varies from company to company. Popular styles include board and batten, plantation, raised panel, Colonial, and Bahama. At Master Aluminum, we specialize in a select few styles to focus on consistent quality, the design of our goods, and designing a product that is superior to the competition. There are many different materials a shutter manufacturer in Tampa Bay might use. However, each material offers different benefits that should be taken into consideration before you make a decision. When looking for outdoor blinds, the chosen materials matter even more. Louvers made from plastic are moisture-resistant, but plastic is not the most stable material and puts a strain on frames and hinges. Also, UV rays turn these louvers brittle, and they often yellow over time. Wood composite comes in many shapes and colors, offering a more customizable option. However, the humidity and rain of Tampa Bay damage the structure, causing sagging and joint failure. Premium woods, though a more expensive choice, are a durable option. They are difficult to damage and resist warping. However, due to the high moisture of our area, shades made from premium woods are not recommended. Laminate is a popular option you can wrap, paint, and stain to create a custom look. However, as with many other choices, a laminate is not ideal for humid conditions. While most products that come from any shutter manufacturer serve the same primary purposes, to offer privacy and shade, some businesses design their blinds to do more. For louvers that offer hurricane protection, not every material is fitting. Aluminum is the strongest, most durable, environment-resistant choice. Aluminum resists bending, warping, and serves as a buffer against projectile objects during a severe storm. Also, these blinds come in many different colors to fit any home. Some businesses in Tampa Bay do not place enough importance on the quality of their products. At Master Aluminum, superior, high-quality blinds are our focus. 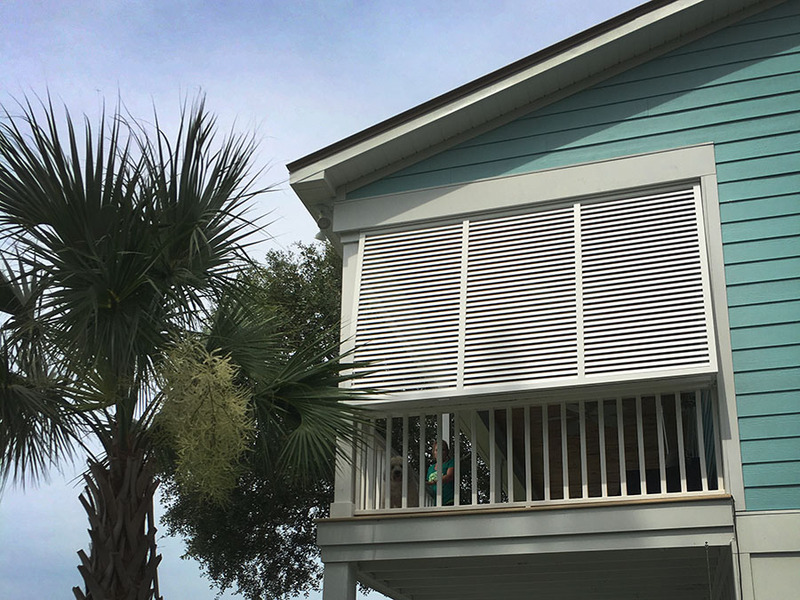 Rather than make a variety of blinds, we specialize in aluminum Bahama- and Colonial-style hurricane-rated shades. By concentrating on these two specific styles, we can focus on designing and creating products that we are proud of. Residents in Tampa Bay trust us to be the shutter manufacturer they choose for sturdy and attractive commercial and residential blinds. To further guarantee shades of the highest quality, we offer three, five, and seven-year warranties on our products. In addition, we are enrolled in a quality assurance program administered by the National Accreditation and Management Institute. This program requires our plant to keep records of measurements to guarantee acceptable tolerance levels of materials. Not every corporation in Tampa Bay will go to such lengths to ensure durable products and customer peace of mind. Once you have narrowed down your choices for the right shutter manufacturer, use local reviews to help you make the most informed decision. Ask friends and others that have experience with home improvement companies and check online to see what others think. Facebook, Yelp, and Google provide honest ratings of companies to help those looking for services. At Master Aluminum, we take our role as a hurricane-rated shutter manufacturer seriously. Our top priority is providing customers in Tampa Bay with window protection that lets them rest easy when a storm hits. In addition to our Florida building code-approved items, we craft architectural and decorative options, like arched and board and batten panels. Our products also come in a variety of standard and custom colors to match any home. For more information on our products, visit us online or call us at (727) 725-1744. © 2017 Strategic Media, Inc. | All Rights Reserved | Site by: Strategic Media, Inc.